Back in January I launched this blog and shared my All-In-One Genealogy Worksheet. That was the first time I’d shared the individual worksheet with other genealogists. Heck, it was the first time I’d shared anything online, and I was nervous about the entire venture. But it’s something that has been so valuable to me in my research, and I believed it would be useful to you as well. Eleven months, and one massive sigh of relief later, the number of downloads is over 2,000! And people have taken time out to send in feedback and suggestions to make it even better. So now it’s time to launch the next version of my genealogy individual worksheet. To make it easy, let’s call the new version 2.0, but it’s probably closer to 20.0. I created my first worksheet back in 1991. Encouraged by my Aunt Pat and Uncle Dud, I posted that worksheet out to relatives all over the country. To people that I’d never heard of, let alone met. Then spent my Sundays in the State Library wrangling microfilm and thus began my genealogy journey. I love the simplicity of my original worksheet. At the time, I thought that was all I would need to capture to understand my family story. Fast forward 26 years, my research process is entirely different. While I still obtain information directly from relatives, I now know that there are so many more questions to ask. As well as fact-checking and verifying all that fabulous information. My go-to genealogy worksheet has evolved into an information snapshot, research planner, and checklist. I love checklists. They’re a fabulous way to stay on track and know what you’ve done. And see what you have left to do. It’s also a great companion to a research plan because you can pick it up months (or years!) later and know where you are up too. With every version, the worksheet grows a little bit more. It’s now four pages, but the fourth page is optional as it is just for notes. If you are printing two-sided, then it’s worth keeping it in. Individual snapshot and checklists on page 1. Spouse and children on page 2. You could add more of these if your ancestor married more than once. Use the census, education, employment and residential records to map out the individual’s life on page 3. Make notes of progress or findings to further explore on page 4. Spouse & children now have a page all their own to make it easier to add extra pages for second or third (or more!) marriages. No fonts to download. The form uses Arial Black, Georgia, and Tw Cen MT. These should be standard system fonts for all users. Open either the DOTX or PDF file, whichever you prefer, and you are ready to go. I recommend using the PDF file because you can type in what you know. Then print out the pages and write in the rest. With the Word version, you’ll need to delete the fields first as the prompts will print out as text. If you have a question or are looking for general help, then try the Quick Guide. Should the answer prove elusive, then send me a message or leave a comment below or on the pinned post on my Facebook page. Remember to save the file before you starting typing. And keep saving every few minutes because you don’t want to lose all that hard work! There are two options in the resource library – US and A4. The US folder contains files set up for 8.5″ x 11″ paper. And the A4 version is for a 210 x 297mm page. Are you planning a Genealogy reboot? 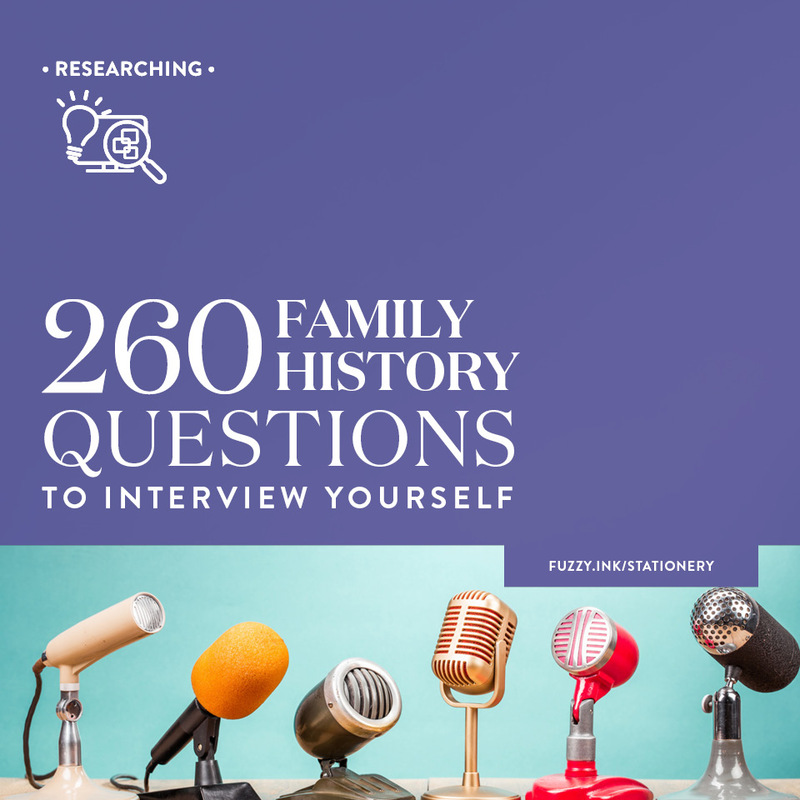 If you are planning a genealogy reboot in 2018, then this is a great resource to add to your toolkit. It’s easy to update and share with relatives or other researchers. I have been using a version of this form since 1991 for all of my genealogy research. Whenever I start working on an ancestor, I staple a copy to a C4 envelope. It’s portable so great for trips to the library, cemetery, and archives. And the pocket makes it easy to keep photos, notes, certificates and records in one place. Drop a line in the comments below to let me know what you love (or hate) about the updated worksheet. Can you name any records or resources that I’ve missed? Thank you! This will really help me. There is so much to learn. Am I just not seeing it or are there spaces for federal and state census’? Love your forms!! 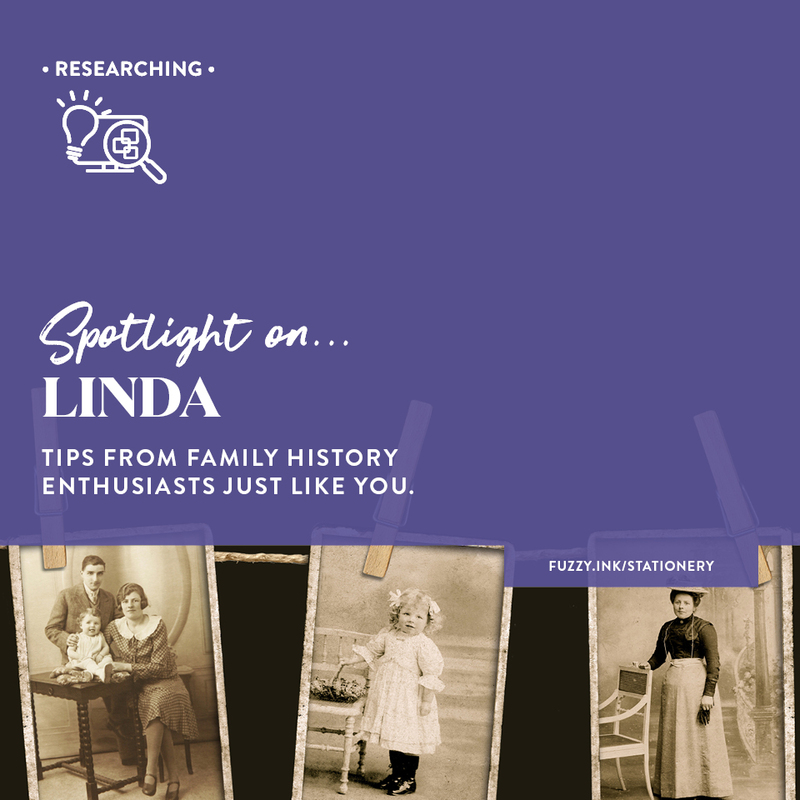 I am an experienced genealogist but I’m always on the look out for great ideas and you certainly hit a home run with these. Thank you!! No there aren’t specific spaces for federal or state census’ but that’s a fantastic idea. It’s now on my to-do list to be added to the form. Thanks so much for the suggestion. I was finally able to download your all-in-one worksheet. I love it; there’s so much on it. I have one comment about the address section. I lived in several different places growing up and getting married, but I could only add my first two addresses. The remaining lines are white and can’t be typed on. How can I fix that and add more lines. Do I have to pay Adobe so I can edit, or can you add more lines? Good pick up Margaret! No purchase is required, the fields were hidden. I’ve fixed this and will send you an email with the update. Or you can jump back in the library and redownload the file. As several other people have mentioned, I can not find any way of downloading the all-in-one genealogy worksheet. All I can find are continual requests to become a member of the resource library, which I have done. Please help! The main problem is with copying and the pasting the password. A pesky space is being added at the end which is invalidating the password. If the screen seems to flash and nothing happens, then the password is incorrect. Try deleting the last character (after pasting) and then hit enter. Do not understand this but no matter how I try I can not get the genealogy worksheets. Oh well, it is what it is. Hi Jeannine – I’ve checked your subscription to the library and the reason you haven’t received the access key is that your email is registering as bounced which means the email was rejected. This is often a result of a typo in your email address or the email server being unavailable. I’ve sent you an email as well. If you receive that, then please reply and I’ll work to resolve the issue. If not, you can check your email address is correct or contact your email provider. Hi Prudence, I’m excited to see these worksheets, but what is the well-hidden secret to finding the actual download? I cannot find it anywhere!! Thanks much! Hey Gina – there is no direct link from the site. If you follow the link from the email you received and add the password then you should be in. If you have a problem, try deleting the last character after you paste the password (there is a good chance it’s a pesky space), then hit enter. I’ll send you an email as well with this tip. I too cannot find a way to access the worksheets. I have subscribed numerous times but still end up on this page with no access. Very frustrating. Hi AnnMarie – you have been a subscriber since June 2017. As you are already on the list, completing the subscription form will be ignored by the system. The Resource Library was announced in the first September newsletter. And the login links and details are included with every newsletter. I can see from the system that you haven’t been opening the newsletters so I’ll send you an email with the required information. If you need anything else, send me an email! There is no link for members to get to resource library. The only link coming up anywhere is to sign up for the newsletter. That’s correct. At the moment you only receive the link in the initial email, plus every newsletter. You can bookmark it if you use it a lot but please keep your eye on the newsletter as there are some changes coming up which will change the access to the site. I would like to say ‘Thank You’ for this, I have only recently started genealogy but have been searching for a good FGR with combined research log since I started and yours is exactly what I was looking for, both simply and elegant. I’m so excited to use your Genealogy Worksheet! I can tell you spent hours and hours making and tweaking this. It’s wonderful!! The download was successful but I hit a snag. Oh, how I wish you made the first worksheet (.dotx) into a .pdf! I am a Mac user and all the Word formatting gets mixed up. Is there anyway you could make that page into a .pdf for us Mac users? Without it, the rest is kinda useless. Just beginning my genealogy search…need all the help I can get! Good luck with the research Denise. It is frustrating when you keep hitting dead ends, but fingers crossed you solved some of those mysteries this time! I very much am interested in your worksheets but I can’t get the website to work for me! I’ve entered my name and email but it just goes “round and round” and still won’t let me access the forms. Can you help? I’ll take a look and send you an email. Hi Arlene – I can see that you have signed up and the email has been sent to you with the link and password. Check your spam folder first to see if it’s hiding in there. If nothing, send me an email at hello@fuzzyinkstationery.com. Prudence I can’t download work sheet kit I’ve tried several times. Hi Kathy – Did you work through the troubleshooting steps in the download under NEED HELP? in the original email? If you have and none of those issues apply then please email me at hello@fuzzyinkstationery.com and let me know what is happening? I’ll do my best to help you out. I’ve already sent you my name and email address m, and received the code. I don’t have a device that can unzip the files. Can you email me the individual documents instead? PDF format 81/2 x 11 would do. Hi Graciela – you can download unzip software such as WinZip, WinRAR, 7-ZIP or Stuff-It Expander if you are on a Mac. Whichever one you pick should have a free trial which will let you unzip the files. I have tried several times to download this item with no success. What is the trick? Have you downloaded the troubleshooting tips that mentioned in the email? Try those first and if nothing works the email hello@fuzzyinkstationery.com and let me know which browser you are using and what is happening when you try to download the files. Unfortunately, I don’t have that kind of control over the icons with this website theme. It is something I will keep in mind for future themes for sure. If you want to become a library member and download the form then that might work better for you. If you have issues, please email me and let me know. I noticed that the pdf’s are saved through the web. Is this information secure? The PDFs are all stored on a secure server and will be downloaded to your hard drive (or another preferred drive). If you are opening the files in a web browser then that will be a setting specific to you. It may be that you don’t have Acrobat Reader or that you have set your PDF files to open with that application. The All-in-One Worksheet is AMAZING! THANK YOU! This is REALLY stunning work! Thank you so much for sharing your time and talents!! Is there a Mac version? or for iPad? This looks great, and I would love to use it if possible on my MacBook Air or iiPad., Thank you! Hi Cheryl – there is a PDF version so you can use that on any device where you have PDF reader. Also, what’s involved in copying a page like the marriage and children page when more space is needed and still keeping it all together? I understand your concern about fields that imply specific religions, but like all forms, there will be sections that won’t apply to your ancestors. As you’ll have gathered from the blog post, this form has evolved as a result of being used in my research. I am of Irish Catholic descent, so the wording and options are very much in line with that type of research. If you have checked out the FAQ and other files, then you’ll notice that there is a Word document included in the zip file. 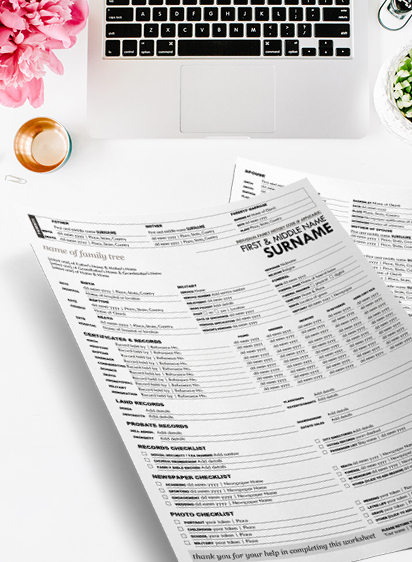 This format was supplied to give you the opportunity to fine-tune the wording of the form for your own research. If there are fields that don’t apply then you can change the labels in the Word version to whatever suits your research so the fields don’t go to waste. You’ll also find the answer to adding pages in the FAQ. Just found your blog and LOVE, LOVE, LOVE it! 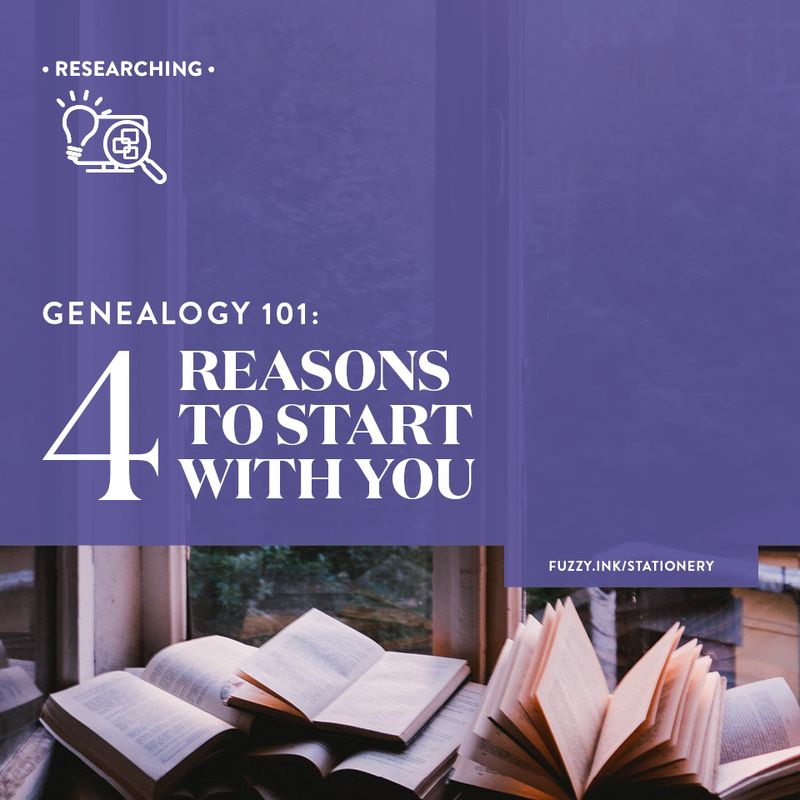 I am excited to use your resources to help with my genealogy and my writing of the family history. I really like the worksheet. I am in the process of verifying people on my tree and making sure that I have all pertinent information. The one thing that I would really like is to be able to list the maternal and paternal grandparents. Even just using the grandparents and g’grandparents first and last names, I can’t fit both sets of names in. The space for the name of the family tree would give plenty of space to add in the 2nd set of grandparents. I know that I can adjust the form to fine tune it with the word version, but I like the cleaner version of the pdf file. Or even just having the option to chose g’daughter/G’son on the great grand parent’s line. Thanks so much for your feedback. I will be adding more versions of the worksheet to the resource library over the next month, so I’ll look at this to see what I can do to make it more flexible. I am looking at removing the dropbox altogether and making it a text field. I’ll let everyone know via the newsletter / Facebook / Instagram once the new forms are live. Is there anything else that would make the worksheet more straightforward to use? Thank you so much for sharing your worksheets. This looks like a marvelous form but I don’t have Word. Does that mean I can’t use the form? P.S. I think I misread your comments but I want to clarify before I download the form. Sorry for the confusion. Hi Anita, the form is available as a PDF or Word doc. You will need the latest version of Acrobat Reader which is available for free. Thank you for sharing your hard work ? Thank you so much! These forms are great! I am a visual person and I was wondering if you have a copy of one filled out? I’m not sure where to start. Do I start with my name or my father’s/mother’s name? It’s probably obvious but I need to “see” it to “get it” LOL. Thanks again for sharing! Hi Marlo, There is no specific starting point, just add the content you have available. You can use the section labels as prompts or take a look at pages 3 to 6 of the FAQ PDF for more guidance. Happy researching! I have just downloaded the worksheets, they are brilliant. The only problem I will have is my great grandmother had thirteen children. I notice there is only space for eight children on the sheet?? Any suggestions for how to enter the remaining five children. There are other versions available (EG 1 spouse, 18 children) but these are currently only available from the Resource Library for newsletter subscribers. There will be more versions uploaded by the end of August after I make some tweaks to the form.